Easy. – Life Is Such A Sweet Insanity. 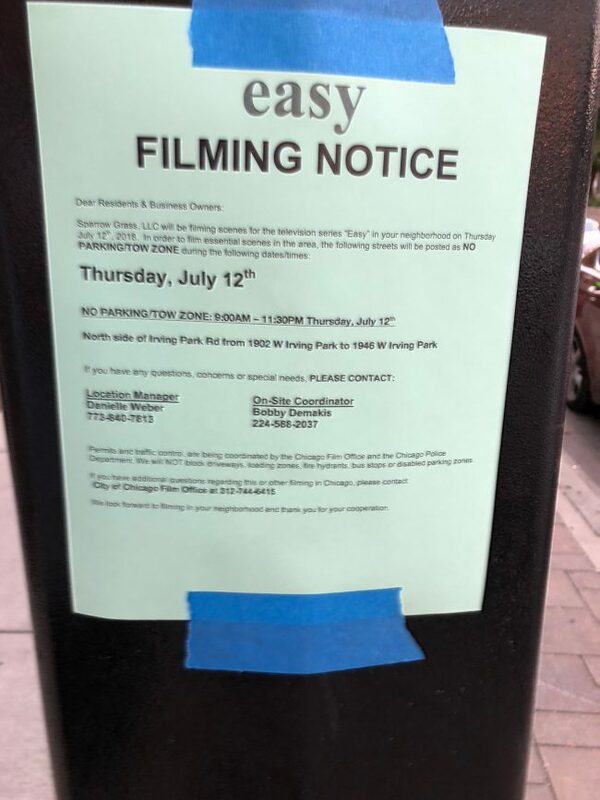 The Netflix series “Easy” is filming in our neighborhood this week. Earl and I couldn’t recall the series when we saw the signs posted along nearby streets, but then we looked it up at home and realized we had watched some episodes back when we lived in Central New York. We started watching season two this evening. I remembered enjoying the series when watching season one last year (before our move), watching season two is extra fun because we live in the same city as where the series takes place and was filmed. This never happened when we lived in Utica, because after all, the only thing that took place in Utica was the first episode of a Jenny McCarthy flop, and that wasn’t even filmed in Utica. If you want to see what it’s about, here’s a link to the show on Netflix. “Easy” on Netflix. The “new” content channels are so much better than the traditional networks. “Easy” is on on our binge list for the month. We’ll have to check out the filming going on later this week.